Thoor Ballylee was regarded by the late Nobel laureate Seamus Heaney as ‘the most important public building in Ireland’. Its close association with the poetry and family of W.B.Yeats makes it an iconic landmark for the area and for the country, and a resonant site for literary pilgrims from across the globe. Thoor Ballylee is set on the bank of the Streamstown River, a tributary of the Cloone River, near the market town of Gort in Co. Galway. Thoor Ballylee began its life as a fortified tower built by the de Burgo or Burke family. The Burkes had established themselves in Connaught after 1200, becoming Earls of Clanrickarde, and the demesne formed part of their large estates . The original tower was probably a timber built fortress, as Hiberno-Norman built stone castles did not come into vogue until the 15th century. The present imposing stone tower dates from around this time. The nearby low-lying four-arched bridge was built around 1825. According to NUI Galway’s landed estates database, by 1837 the Carrig family was recorded as living in what was known as Ballylee Castle. At the time of Griffith’s Valuation (1857), Patrick Carrick was leasing a herd’s house, castle and land at Ballylee, barony of Kiltartan, from William Henry Gregory. The property was valued at £5. On William Gregory’s death control of the demesne passed to his widow Lady Augusta Gregory who managed the nearby Coole Estate. Under Gregory’s watchful eye Coole House had become a centre for literary and political gatherings, welcoming a great number of notable figures of the day, including William Butler Yeats, his brother the painter Jack Yeats, George Bernard Shaw, John Millington Synge, George Russell (A.E. ), and the first President of Ireland, Douglas Hyde. Together with Edward Martyn, who lived down the road at Tulira Castle, Yeats and Gregory founded the Irish Literary Theatre, soon to become the Abbey Theatre. 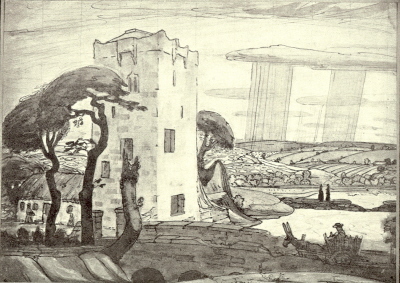 Yeats described the tower and surrounding landscape in his book The Celtic Twilight (1893), which featured local stories about the area and a poem by Antoine O Raifteiri (known to Yeats as Raftery, the poem translated by Lady Gregory) concerning his love for a local beauty named Mary Hynes. Today Thoor Ballylee is often referred to as Yeats’s Tower because in 1916 Yeats fulfilled a long-held dream to establish his own house in the west of Ireland. Memories of his youth in Sligo and an attachment to the Galway landscape conspired together: the tower’s proximity to Coole (and to the railway) decided him. By this time the property was vacant and rundown, and he was able to purchase it for just £35. Yeats and his architect, Professor William A. Scott, spent several years restoring the tower and associated cottage and outbuildings. With the builder Rafferty (whom Yeats insisted on calling ‘Raftery’ after the poet) they took care wherever possible to use local materials: when the thatching straw was ruined by the damp, local slates were enlisted as roofing. Larger windows were installed in the lower floors, while the tower retained its original windows in the upper part, and the inside was decorated with designs of constellations and esoteric symbols. It was rechristened Thoor Ballylee: a verse inscription in stone on the wall celebrates its restoration, as well as foretelling its ruin. From 1921 to 1929, Yeats with his family spent many summers there. Its constant damp made it impractical for winters, but in the summer Yeats’s wife George was often to be found fishing from the tower: it is possible to drop a line out of the window straight down into the river that runs alongside. Yet more than a living space the tower represented the poet’s monument and symbol. Many of Yeats’s most important poems feature the tower prominently: many were written there. The early modernist elegy ‘In Memory of Major Robert Gregory’ remembers the Yeats family’s settling into tower and cottage as it commemorates the death of Robert Gregory, Lady Gregory’s son, an artist who himself had pictured the tower. 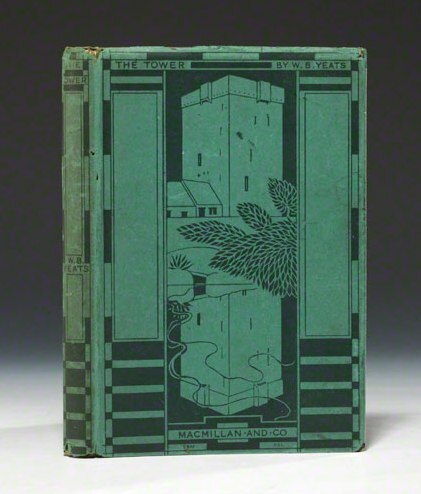 Yeats’s books of poems The Tower (1928) and The Winding Stair (1933) drew direct inspiration from the tower’s rooted existence and featured views of the tower and stair on covers designed by Yeats’s friend Thomas Sturge Moore. With Yeats increasingly prone to illness, and after 1928 spending his winters abroad, it became impossible for the family to keep up the tower, prominent as it was in the poet’s imagination. By the time of Lady Gregory’s death in 1932 and the taking of a lease on Riversdale in Co. Dublin they had ceased to come and stay, and the buildings gradually fell to disrepair. Long after the death of his father and Lady Gregory the poet’s son Michael Yeats generously arranged to hand over the tower to the care of Ireland West. A native of Carron, Co. Clare, Mary Hanley (1914-1979) had founded the Kiltartan Society in 1961 to foster interest in the literary history of the district, especially that of Lady Gregory, Edward Martyn and W.B. Yeats. It was she who was chiefly responsible for the restoration of Thoor Ballylee (with the aid of Bord Failte and the Yeats family). At the time the Office of Public Works was responsible for the property. Hanley persuaded the poet Padraic Colum to open the castle on Sunday 20 June 1965, near the centenary of Yeats’s birth, to appear as it was when he lived there and refitted as a Yeats museum containing a collection of first editions and items of furniture. A multimedia visitor centre was opened and the tower became an important destination on west of Ireland tours, attracting farflung visitors and functioning as probably the most rhapsodic tourist office in the world. Always prone to damp, due to its proximity to the river Thoor Ballylee is occasionally subject to flooding. The waters ran high in 1995 and over the winter of 2009, when Co. Galway was cut off from the east of the country and the tower was extensively damaged. For a while it appeared that with the financial problems of the Irish government no money would be available to repair it. Ireland West, the custodian of the tower, no longer existing, the organization was subsumed into Fáilte Ireland whose mandate does not include protecting or promoting heritage sites. Thus only in February 2012 did work begin on restoring the tower, although no opening date was then envisaged. Although the tower remains closed it has been totally cleaned and heated and restored to pristine condition. A planned programme of engineering works should ensure that such extensive flood damage is a thing of the past. It is hard to overstate the building’s international significance, and its importance to the local community. Given the number of visitors arriving and being unable to access the building, a local group, the Yeats Thoor Ballylee Society chaired by Senator Fidelma Healy Eames is working on raising funds for its permanent restoration and allowing it to open in summer for visitors, events, and readings. Thoor Ballylee opened again for the 150th anniversary of Yeats’s birth in June 2015. Following winter flooding it will reopen again for the summer of 2016 with a new exhibition.